At the mere mention of chokeberry, some gardeners envision a rapidly spreading wetland plant with a profusion of suckering stems. These characteristics of the common red chokeberry,Aronia arbutifolia, limit its use as a landscape garden plant. However, the black chokeberry, Aronia melanocarpa, which is more user-friendly, certainly deserves its rising popularity — and serious consideration for your garden. With a smaller, more pleasing form than its red-fruiting relative, the aesthetically pleasing Aronia melanocarpa is being heralded throughout the Midwest for its year-round interest. An extremely hardy deciduous shrub that will reach maturity in five years, the black chokeberry is a perfect choice for naturalizing. If left alone, the plants can form colonies that provide food and shelter for wildlife. Black chokeberry is adorned with larger leaves, fruits and flowers, and ends the growing season with a more spectacular fall color than the red chokeberry. A member of the rose family, Aronia melanocarpa tolerates partial shade (up to 50 percent) but thrives in full sun. Hardy to zone 3 (the Chicago area is zone 5), it is also an excellent choice for those tough, low-lying wet areas where only moss and mosquitoes flourish. And yet it can acclimate itself to dry, sandy locations as well. Although Aronia melanocarpa is native to eastern North America, it is widely planted in eastern Asia. In 1967, Howard Brooks, of the United States Department of Agriculture, collected plants in Russia to test at an Iowa site. The plants there suckered freely — a trait that may be desirable, depending on the location. Although studies note that chlorosis may be a problem in alkaline soils, no symptoms were detected on any of the specimens here at the Chicago Botanic Garden, where soil pH can reach 8.5. The leaves of black chokeberry emerge a medium green, followed in early spring by a showy display of clustered white flowers borne in corymbs 2 to 2 1/2 inches across. As the season progresses, the leaves turn a deep, glossy green, which brightens the plant and heightens its appeal during the dog days of summer. In mid- to late summer, the berries start to develop; within two weeks many of the branches droop with heavy clusters of fruit. Ripening a purplish black, the 1/3- to 1/2-inch berry persists into January — unappetizing for birds (hence the name), but wonderful for winter interest. A display of black chokeberries can be seen in many areas of the Garden, including the Regenstein Fruit & Vegetable Garden, the Native Plant Garden, and the Elizabeth Hubert Malott Japanese Garden. Black chokeberries are also planted extensively throughout the parking areas, where they are performing well despite the clay soil, high pH, and intense heat of those exposed sites. The selection Iroquois Beauty™ was introduced to gardeners through the Chicagoland Grows® Plant Introduction Program. This shrub features many ornamental traits, including a compact habit and outstanding fall color. 'Mandshurica' displays deep green glossy leaves and a more upright habit. 'Autumn Magic' originates from a seedling population in eastern North America and demonstrates large fruit size, superior fall color, and a very desirable habit. 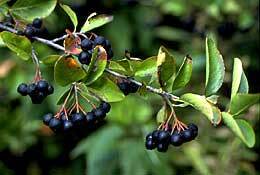 With careful attention, the black chokeberry would be a welcome addition to the Landscape Gardens. Some maintenance is needed to attain a clean habit and to control the suckers, if desired. However, those willing to invest a little time will reap numerous benefits of their labor by witnessing all that the black chokeberry has to offer.